Over the years I’ve used a few different VHF/UHF aerials here and the one I always found the best was my old Diamond X500. I bought that when I still lived at home with my parents and it moved here with me. It ran my original AX25 packet radio BBS and then MB7UIV and was only taken down in June 2010. When it was given away, it was in perfect working order, if just a little dirty. I replaced it with a beam for 2m and added a Sirio 827 for 28MHz (10m). Eighteen months or so later, I replaced the Sirio 827 with a Sirio Gain Master and that was destroyed by the wind in February 2014. My VHF beam was removed after the lightning strike in 2011. Since then, all I’ve had up for VHF/UHF is a very small aerial on the front of the house and nothing specific for 10m. Yesterday I fitted brand new aerials to the side of the house – A Diamond X510N and a Sirio 827. The Diamond is on a 20ft pole making it a little over 100ft above sea level where the Sirio is on a slightly shorter pole of 17ft length putting it around 97ft above sea level. Here you can see the two aerials along with the very small vertical on the front of the house that I’ve been using for VHF/UHF for the last few years. Now onto the measurements of the two aerials. 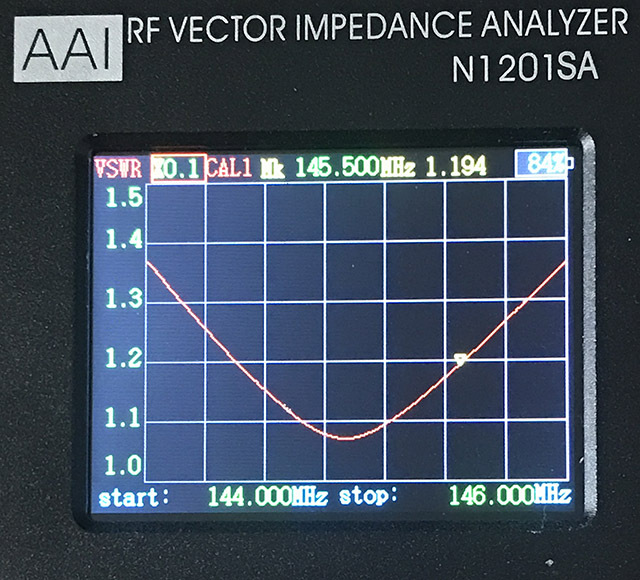 For the Diamond, I used a recent acquisition, an AAI RF Vector Impedance Analyser N1201SA which I bought from Banggood, specifically for the wide frequency coverage from 137MHz up to 2.7GHz. I can thoroughly recommend this unit except for one thing. There’s no way to export the graphs it produces so these were taken by photographing the display. 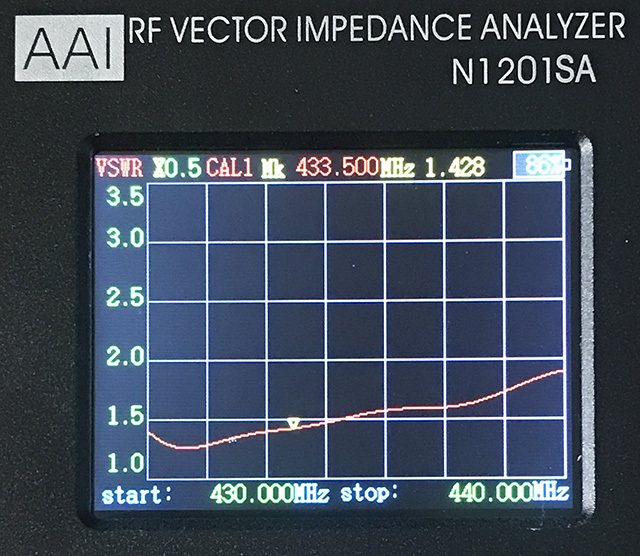 The VSWR on 2m is superb, below 1.4 over the whole band and very nice at just below 1.2:1 on 145.500MHz (S20), the UK calling frequency. It’s a little higher on 70cms at just above 1.4:1 on the calling frequency of 433.500MHz (SU20) and rising to about 1.8:1 at the top end of the band but considering the band is 10MHz wide, that’s not surprising and perfectly acceptable. I’ve already made simplex QSOs on 70cms out to around forty miles and been able to access repeaters on 2m as far as fifty miles away so my initial impressions are that it’s working well. I’m feeding it with around fifteen metres of EcoFlex 15 coaxial cable which gives me just 0.5dB loss on 2m and 0.9dB loss on 70cms. For the Sirio on 10m, I used my trusty miniVNA Pro analyser. 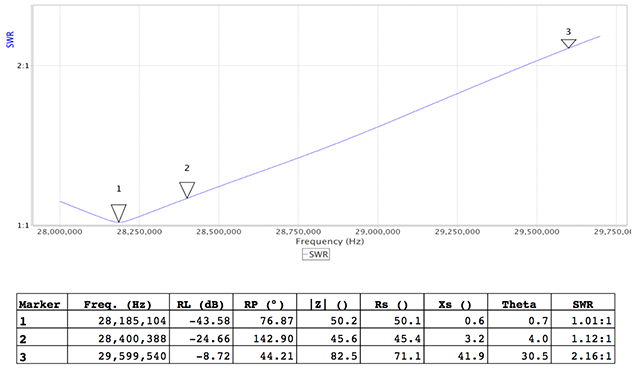 The Sirio 827 is adjusted by the top section, the further in it is, the higher the resonant frequency of the aerial. I had the top section in as far as it will go but seeing as this is sold as a CB aerial, the resonant point is only a short distance into our very wide 10m band. As can be seen, it’s perfectly useable in the CW/SSB segment of 10m but the SWR does raise to nearly 2.2:1 on 29.600MHz, the FM calling and working frequency. It’s a bit windier today so I don’t plan on lowering the aerial but if I get a chance in the coming weeks, I’ll drop it down and try and reduce the overall length just a little further. I’m feeding the Sirio with seventeen metres of RG213/U which gives me around 0.6dB loss on 28MHz. Overall it was a very successful days work and I’m very happy with the results. This entry was posted in Amateur radio, HF, UHF, VHF and tagged aerial work, Diamond X510N, Sirio 827. Bookmark the permalink.